By which dance artist, outside of your own discipline, are you most inspired? Shobha Korambil – Kuchipudi artiste, who is a disciple of Padma Bushan Awardee (third-highest civilian award of India), Dr. Vempati Chinna Satyam. She has shown me what it is to have an undying thirst to dance. She has shown me that one can lose oneself while dancing. She has shown me that dance and the dancer can merge and become one. 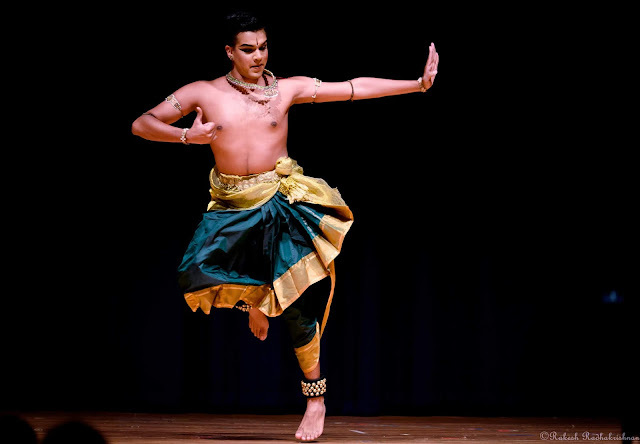 Kishore Mosalikanti –renowned Kuchipudi artiste. While I thought every movement in dance has a feel to it, he said every ‘feel has a movement... An inspiring performer, teacher, choreographer, all bundled into one. His understanding and approach to the art amazes me beyond words. Prabhu Deva –His dance seems like penance to me. He lives in the moment and he lives the movement when he dances. What is the biggest hardship you have faced, or are facing today, with being a performing artist? It is challenging, yet rewarding to be a performing artiste. One has to spend quality time on practising, researching and exploring. But that is not all. Munching it on and on in the mind is as crucial as practice - this is an important lesson I have learnt from my teacher, Sheela Unnikrishnan. Apart from all these, one should take time to watch other performers as well. I wouldn't call this a hardship, but this according to me, is what makes a performing artist's journey exciting and challenging. Do you believe in afterlife? If so, what do you think it looks like? I believe that there is 'life after life' until the cycle ceases. "We have been here before and will return again. Our birth is a re-birth. Our death is a re-death" (Devdutt Pattanaik, 'My Gita'). This is a bewildering yet plain phenomenon. If there is something called afterlife, I assume it will be as dreamlike as this one! If time travel was possible, where would you travel to? I would like to travel back to a time when poets flooded the streets with spontaneous outpourings of 'Bhakti, to a time when man was closest to nature, to a time when 'time’ didn't really matter! And I strongly believe this time travel is possible through dance! What does dance do to you? Dancing or watching someone dance, often gives me the experience of a child tirelessly playing with friends. At times, it does what a mother feels on seeing her child. It also does what penance feels like to saints. It teaches me patience, tolerance and what it is to be humane. Most of all, it gives me the chance to escape reality! This article may not be reproduced without prior written permission of the publisher.